This topic has 7 voices, contains 10 replies, and was last updated by vhrob 1861 days ago. Updated my Charvel Star guitar to an original floyd without the fine tuners like Ed’s had and painted my Bumble bee Charvel headstock and added a gold Charvel logo to make it look like the VHII 79 era. Glad I did it I am very happy with how it came out. Now I can say both these are finally where I want them for accuracy for the most part. Beautiful work! How do they sound and play? How’s the neck on that star? How hard was locating an original Floyd? Way to make it happen.. I figured that Danelectro neck would be an effort in itself. Does the Floyd stay in tune fairly well? Do you know the manufacture date on it? I’m guessing around 1980? Man!!! These are probably my #1 and #2 fav EVH guitars to have a replica of. And these look super nice. Love the bumblebee with black headstock. Thanks dokkendude….. Yeah VAiN I think the date is 1980 for the Floyd. It’s a pain guessing where you need to be tuning wise because as soon as you clamp down on the nut it goes sharp (ala the beauty of fine tuners) so you gotta compensate for that a bit. I would not want one of these on all my Floyd guitars, but I can deal with one to make it more accurate. But yeah it stays in tune pretty well. You’re a madman!!! I’m going to hire you soon, my friend! 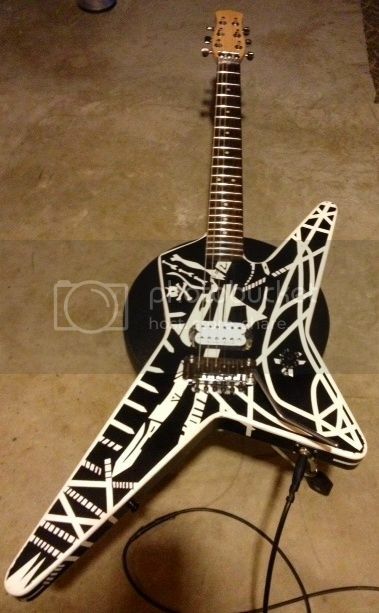 Where did you finally get the neck for the Charvel star. Also, do you find most of the old parts like the 80s Floyd on eBay or somewhere else. Very nice work on both of those beauties. Got the neck overseas because no one would make me a Dano neck with Floyd nut route due to copyright issues, so I took a chance and got lucky with a company from Hong Kong. I got all the parts on eBay except the Floyd. Got it from a guy on the vintage Kramer forum.